University President Rev. John I. Jenkins, C.S.C., introduced the AOV program in 2011 as part of Notre Dame’s ongoing commitment to research excellence, both within faculty and for the undergraduate and graduate students they teach. The president also emphasizes the program’s importance given the University’s commitment to be a sound steward of its resources, a commitment that has taken on even greater significance given current challenges facing the economy and higher education. The winning proposals, which were selected by a cross-disciplinary committee of faculty and deans, aim to build on the University’s existing strengths in chemical and biomolecular engineering, electrical engineering (nanotechnology), topology, global history, analytical chemistry and biochemistry, economics, nuclear physics, computational data science and engineering, applied and computational mathematics and statistics, and non-embryonic stem cell research. In the sciences, says Gregory P. Crawford, William K. Warren Foundation Dean of the College of Science, the interdisciplinary initiatives funded through AOV will transform strategic areas of research where Notre Dame can make a global impact. Engineering projects within the AOV strategic hiring initiative also span a number of disciplines — and pressing human needs. This is a new program in Analytical Sciences and Engineering that will elevate both the Department of Chemistry and Biochemistry and the Department of Chemical and Biomolecular Engineering. This project is led by Norman Dovichi, Grace Rupley Professor of Chemistry and Biochemistry. This project is a hiring initiative aimed at ensuring that Notre Dame’s internationally recognized Nuclear Science Laboratory continues as a leader in nuclear astrophysics, nuclear structure and radioactive beam physics while expanding work in applied nuclear physics. It is led by Ani Aprahamian, Freimann Professor of Experimental Nuclear Physics. This is a joint venture between the Department of Electrical Engineering and the Department of Computer Science and Engineering with the goal of expanding the footprint of the already successful NDnano effort in nanoelectronics to include circuit-level innovation. It is led by Thomas Fuja, professor and chair of the Department of Electrical Engineering. This project is a cluster of hires in Science, Engineering, Arts and Letters, and Law designed to foster integrated global inquiry into the science, tissue engineering, law and ethics related to stem cells for medical use. This is led by David Hyde, professor of biological sciences and director of Notre Dame’s Center for Zebrafish Research. The goal of this project is faculty hires in the Department of Computer Science and Engineering and the Department of Aerospace and Mechanical Engineering focusing on such areas as database management, data visualization, data mining and network science. It is led by Gretar Tryggvason, Viola Hank Endowed Chair and chair of the Department of Aerospace and Mechanical Engineering. Targeted hires of faculty who focus on policy-relevant research in major fields of the economics, support the mission of the University, and collaborate with scholars in other disciplines is the goal of this project, led by Richard Jensen, Gilbert F. Schaefer Professor and chair of the Department of Economics. This project centers on faculty hires to expand department strength in specific sub-fields and seek grants for interdisciplinary studies involving areas such as cancer progression, gene sequencing, environmental modeling and big-data analysis in global health. It is led by Steven Buechler, professor of applied and computational mathematics. This is for increased faculty investment in areas such as Latin American and modern European history as well as emerging areas of strength such as early American history, with a focus on research not limited by national boundaries, such as the history of disease, migration, religious belief and the environment. This project is led by Patrick Griffin, Madden-Hennebry Professor of History. This is an effort to hire scholars in five core areas: catalysis and reaction engineering, micro- and nanofluidics and sensing, materials for energy and separations, computation and theory and biomolecular engineering. It is led by Edward Maginn, Dorini Family Professor of Energy Studies and chair of the Department of Chemical and Biomolecular Engineering. This is a new research group to explore the intersection of mathematics and physics, with a focus on faculty hires to help generate discoveries in quantum field theory that fuel progress in computer science, theoretical physics and topology. This group is led by Stephan Stolz, The Rev. John A. Zahm, C.S.C., Chair in Mathematics. 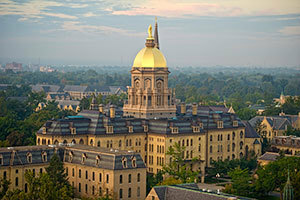 The University is now beginning the process of recruiting AOV-funded scholars to Notre Dame, although the hires will likely take place over a number of years. For more information, see advancingourvision.nd.edu. Originally published by William G. Gilroy at news.nd.edu on December 20, 2013.